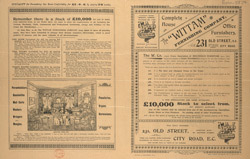 Cheap painted softwood furniture for bedrooms and kitchens was the first type of furniture to be mass produced, and the first to be marketed through department stores rather than sold directly by the manufacturers. These stores set up showrooms and created homely stage sets so that the furniture could be seen in context. These stores were aimed at the growing middle class who were looking to improve their home comforts.